A winningly nasty turn-based cult sim with beautiful monochrome art and surgical orchestral audio. It's a stylish game centered around an interesting moral dilemma. However, there just isn't enough world-building to hammer the point home. 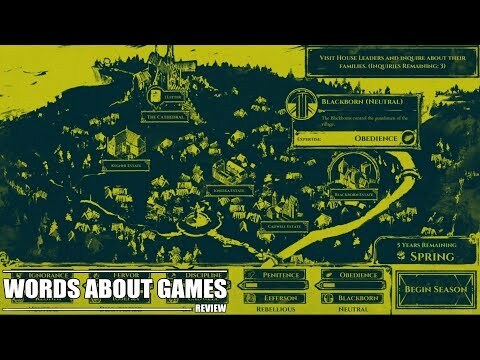 The Shrouded Isle did not feel like a game for beginners to the genre. The premise, the world-building, and sound all made the game into a wonderful sensory experience. But for some time, it also felt like a beast to wrestle with, and an experience that felt more Sisyphean than Lovecraftian. Perhaps that’s just on me to “git gud” in managing my damn cult. “The Shrouded Isle” keeps its grit through replay-ability, due to its random regeneration of NPC sinners, requests from the mighty Chernobog, and random events threatening the cult from the inside-out. The Shrouded Isle may lack variety, but it's strong management systems and creepy aesthetic make it a worthwhile experience. The Shrouded Isle is a perfect game if looking for something quick and easy to play. It captured me for a while though, as I tried to go through many runs to learn the ins and outs of these villagers as I planned out my sacrifices strategically to keep them all in the dark of the true machinations of my charlatan cult leader's goals. That is, if the cult leader is lying. I mean, the Chernabog isn't real, right? Right?. The Shrouded Isle is a game that some of you are going to love, while some of you are going to hate. A management sim that's worth sacrificing a few bucks for. As a combination of both political strategy and Lovecraftian drama, The Shrouded Isle takes this idea and provides a comfortably tense experience whereby every choice should matter but with enough leeway that inexperienced players can still make mistakes. Fans of classic horror literature may be drawn to this game through its distortedly gothic art style and otherworldly premise, but the large difficulty curve may be too complicated for them, even if the repetitive gameplay structure can feel rewarding once you get the hang of it. I fully recommend The Shrouded Isle for anyone wanting an unconventional, horror-led take on the sim management genre. It really does go to some messed up places if your imagination is willing to back up the writing. The caveat here is that it's hard to recommend this Switch version if you're planning on playing it on the go. It's just about worth persevering with if that is your choice, but it's an unfortunate oversight nonetheless. You’ll be hard-pressed to find anything like The Shrouded Isle. It’s not meant to question your faith, but be satirical. You can see the three years pass by in about forty-five minutes to an hour if you’re deeply thinking about things, or thirty minutes if you’re hasty. All in all, each successive replay is different that you’ll need to think how you Inquiry, Appoint, Sacrifice, Repeat. I do wish there was more event variety and more to do, but all-in-all, is a carefully devious game where you truly are the monster.